Ho hum, I’ve just not got around to updating this blog for rather a long time now, and in particular I have been sitting on this post for ages. But as it was intended to be a 2011 award, I guess I’d better at least post it while the year is still current. It was decided to play ghost party first and, as usual, the game was a lot of fun. Miss B insisted on coming up with names for all the characters at the party, and there was lots of squeaky excitement every time Hugo the ghost moved — and particularly when he caught someone (“my human friend is having a ride”). 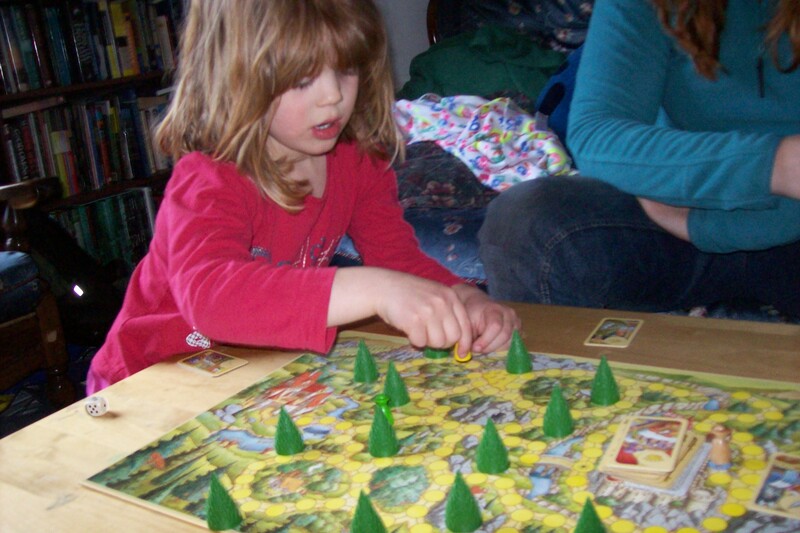 Enchanted forest took rather longer to play. B loves the theme, and generally has fun with the mechanic, but seems to have trouble with the way it can take a long time to gather enough information to visit the king, and can get frustrated with forgetting where things are. As can I, to be perfectly honest. Congratulations to a fine family game that I’m sure we will playing quite often over the coming years. And I expect it will be enjoyed more as Miss B gains in patience. Match-up 1: Loot versus Ghost Party. I’ve said it before: I like Loot. We both have fun playing this using the full ruleset and with the help of Miss B’s card holder device it now plays pretty smoothly with me only occasionally having to advise her on appropriate cards to play. 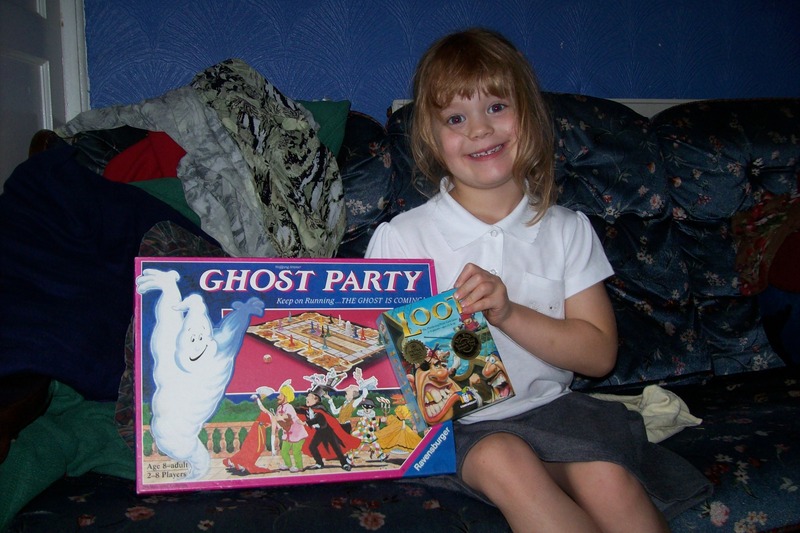 However, Ghost Party is some stiff opposition. We still drop any requirements for exact die rolls and don’t bother scoring, and with that set up this is an all-round fun way to spend 10 minutes or so. I think going into this match-up I always knew which Miss B would choose: Ghost Party. “Because that game is the best I’ve ever played. It doesn’t even matter if you get caught on the stairs.” The judge has spoken. 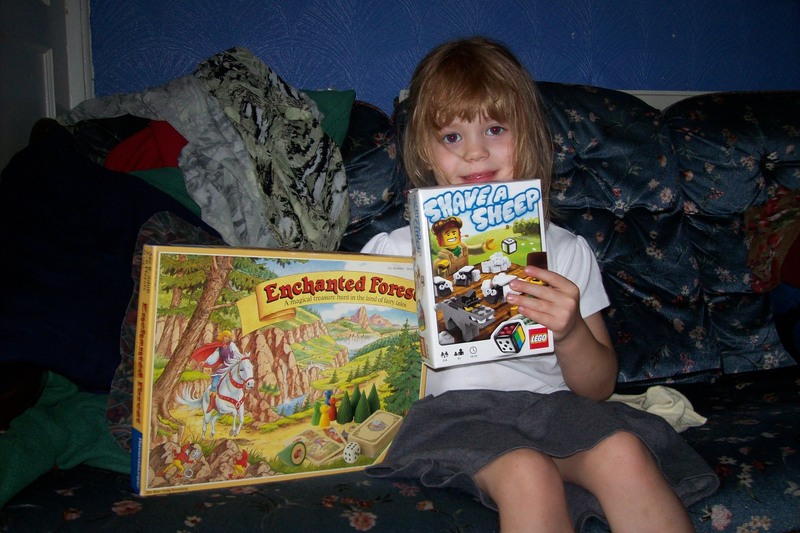 Match-up 2: Enchanted Forest versus Shave a Sheep. So, entering the grand final we have Ghost Party and Enchanted Forest. I know which I would vote for, but I don’t make the final decision. In an attempt to spin this out a little longer, the final result and the announcement of the 2011 Golden Thingummy Award will be covered in a later post. Can you stand the suspense…? Ooh, it’s been a bit of a long time since I last posted, so I figure it’s time to get back to it. 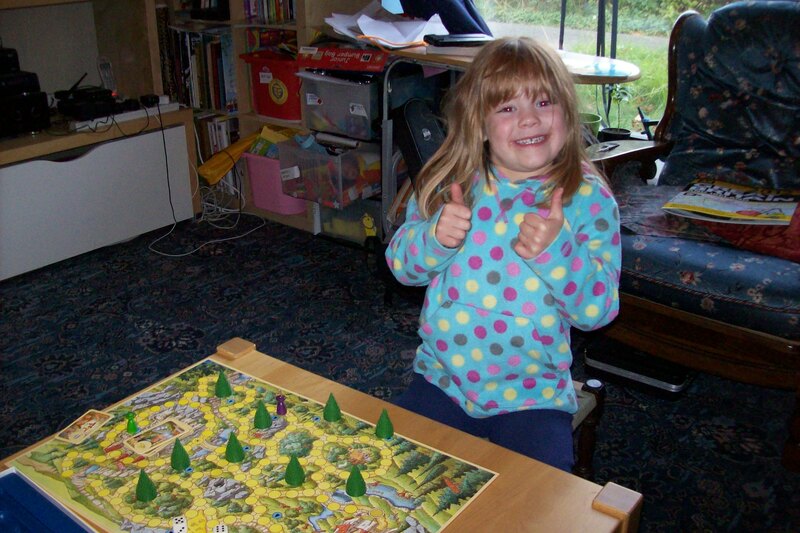 This time it’s something a bit different as Miss B and I have decided to give an award to our favourite game of those we have played. 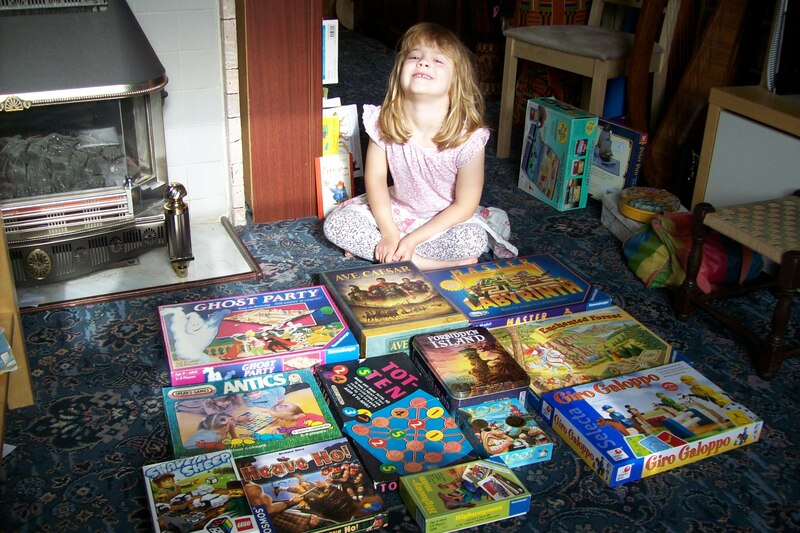 So we dug out the twelve games that we have tested and reviewed so far and spread them out on the floor to provide a pleasingly varied selection. We then decided on how we would judge the competition (or at least I decided, and Miss B agreed that it would be fine). First, the full range would be reduced to a shortlist of four nominees: Miss B would choose two games and I would choose the other two. 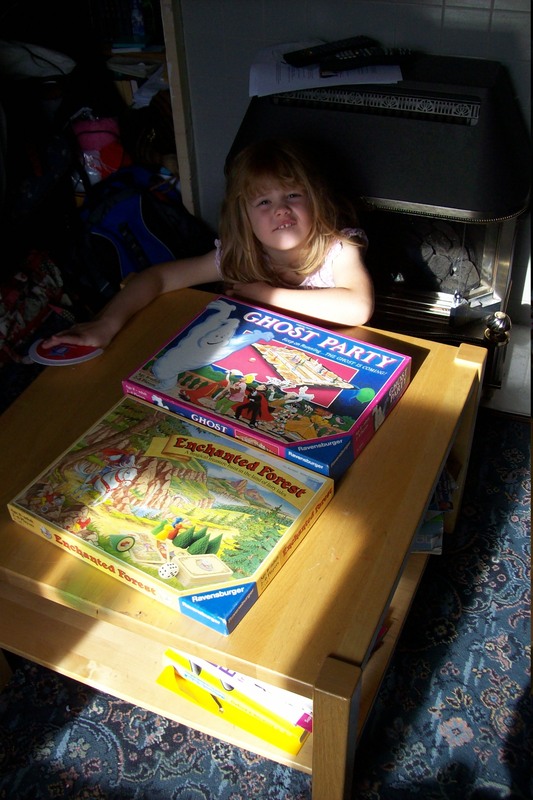 Then we would play two of these games and decide which we thought was best (by which I mean Miss B would decide), followed by the other two, which would result in two finalists to be played off head-to-head in a winner-takes-all gamestravaganza. 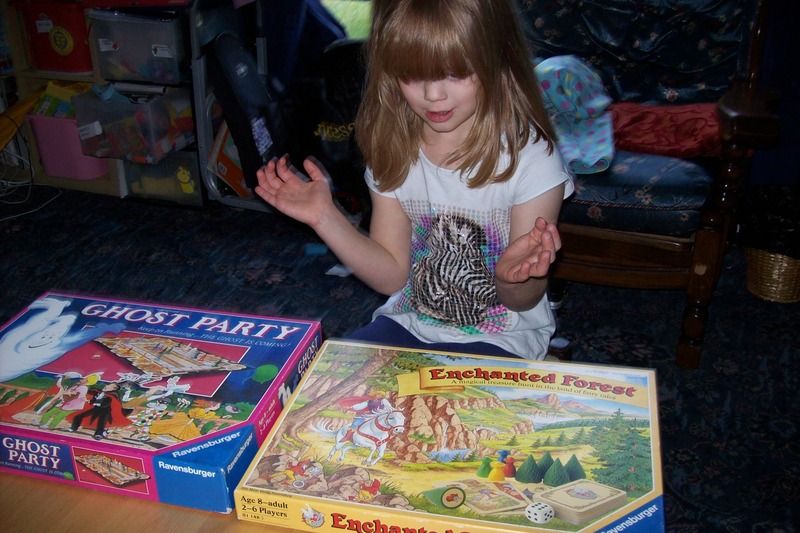 After a bit of a discussion, Miss B made her selections: Ghost Party “because I like Hugo chasing all the people around to get into rooms” and Enchanted Forest because “I like finding fairy tales”. Yup, two good choices there. As for my choices, I considered my place here to choose a couple of games that I think we have had a lot of fun or value out of that I think might give B’s games a bit of a run in the playoffs. 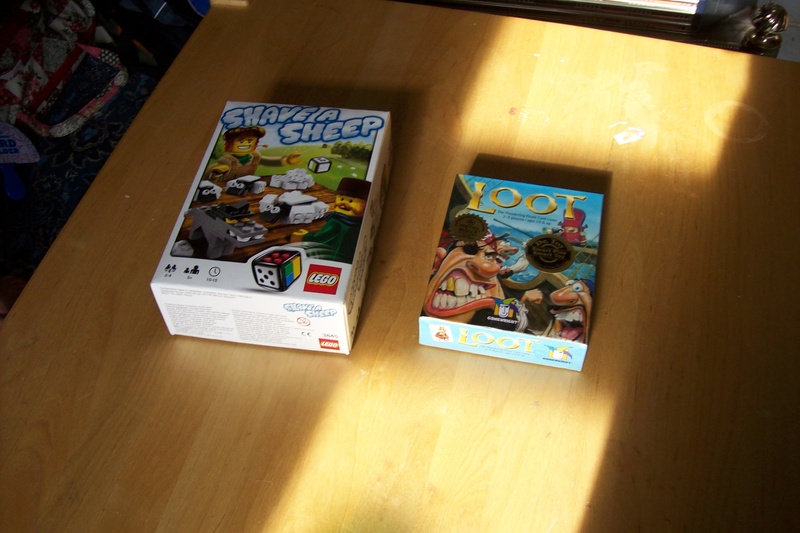 So I chose Loot, which I enjoy playing even for just the two of us, and which has introduced some good card gaming principles to the mix, and Shave a Sheep which, though it wouldn’t be high up my personal chart, has provided a lot of fun and entertainment for all of us and I’m sure it will continue to do so. Watch this space to find out which game gets the award. We’re still looking for a good name for it, by the way.